The delightful town of Arucas sits beneath a dormant volcano on the northern coast of Gran Canaria, and is one of the most popular places for tourists to visit. The neat town is dominated by the majestic Church of San Juan Bautista, carved in stone by local workers. The town is also the centre of sugar and rum production on the island and visitors are welcome at the Fabrica y Museo del Ron to witness how sugar cane is turned into rum. It is possible to take a short walk out of the town to the Montana de Arucas viewpoint for a panoramic look at the northern coastline. The town is scenically situated, surrounded by fields of corn and potatoes and banana plantations, and the Palmitos ravine provides some beautiful vistas. The stunning, UNESCO-listed Gran Canaria Biosphere Reserve is also easily accessible from Arucas. 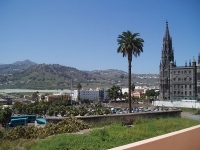 The town is very close to the city of Las Palmas de Gran Canaria, which is the co-capital of the Canary Islands and has numerous historical attractions as well as the pleasures of sun, sea and watersports to offer visitors and is one of the main travel hubs in the region. Arucas is therefore a great excursion from the city, providing a bit of rural charm as a break from the urban glories of Las Palmas.